The Large Hadron Collider (LHC) will start smashing particles together at unprecedented speed on Wednesday, churning out data for the first time in more than two years that scientists hope might help crack the mystery of "dark matter". The LHC, a 27 km (17 mile) underground complex near Geneva, will smash protons at 13 tera-electron-volts (TeV), almost twice the energy achieved in an initial three-year run that began in 2010. This proved the existence of the elusive Higgs boson particle, a discovery that produced two Nobel prizes in 2013. Nobody knows quite what the LHC might reveal with its new particle collisions -- mini-versions of the Big Bang primordial blast that brought the universe into being 13.8 billion years ago -- but scientists hope it will produce evidence of what has been dubbed "new physics". This concept includes "dark matter", thought to make up some 96 percent of the stuff of the universe while being totally invisible, and super-symmetry, or SUSY, under which all visible particles have unseen counterparts. "The only thing we really know is that there is 'new physics' because the model that we have is not complete," said Luca Malgeri, a scientist working at the European physics research centre CERN. "It might be linked to dark matter or it might not. It might be linked to something totally new." In a brief statement on Tuesday, CERN said the LHC would begin early on Wednesday morning "delivering physics data for the first time in 27 months". If there is a particle missing from current knowledge of the building blocks of the universe, CERN scientists hope that it might be spotted, even fleetingly, in the debris of the billions of collisions, just as the Higgs boson was. The first results might come early, Malgeri said, because the LHC already searched for smaller particles on its previous run, and a bigger particle might show up quickly, if high energy collisions are the key to its existence. It may have extremely weak interaction with other forces, which might explain why it had never been observed before. 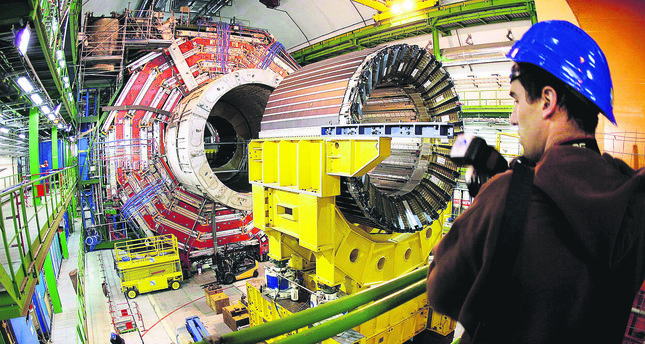 The CERN scientists would hope to detect any dark matter by noticing that some energy was missing after the collision, which would betray the existence of such a particle, Malgeri said. d-for particle is only created very rarely, it may take many more collisions to find it, which is why the number of collisions - the LHC's "luminosity" - will increase over the next three years until it is 10 times brighter than on its first run. Whether anything will be observed, however, is anybody's guess. "This is the million dollar question," Malgeri said. "We are wide open. After the first run of the LHC, all possibilities are equally probable for new physics."